Eurodollar is still being corrected. It looks like price may continue falling down for a while during the day, but later market is expected to start new ascending movement towards several fibo-levels near 61.8%. As we can see at H1 chart, target of current local correction is level of 50%. 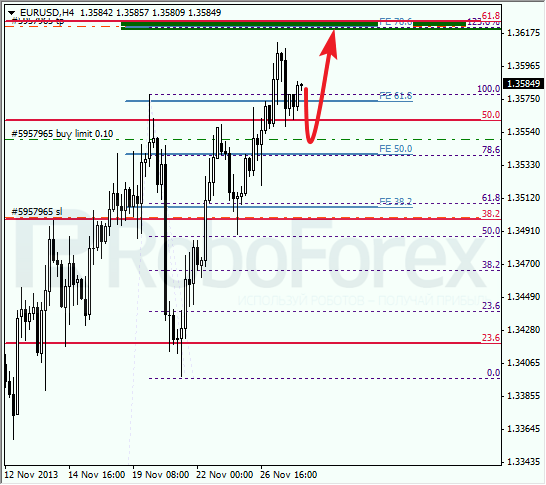 According to analysis of temporary fibo-zones, this level may be reached during Thursday. If market rebounds from it, I’ll increase my long positions. Right now, I’ve got only one limit order. Franc may also yet correct for a while, but later price is expected to start final descending movement. Target is still in area formed by three fibo-levels. Local target for bulls is level of 61.8%. According to analysis of temporary fibo-zones, pair may reach this target during the day after completing local correction. If price rebounds from level of 61.8%, I’m planning to open sell order with target ay lower levels.